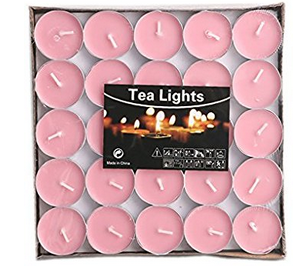 Product categories of Color Tealight Candles, we are specialized manufacturers from China, Color Tealight Candles, Unscented Colored Perfume Tealight Candles suppliers/factory, wholesale high-quality products of Colored Tealight Candle With Aluminum Holder R & D and manufacturing, we have the perfect after-sales service and technical support. Look forward to your cooperation! We can produce colorful Tealight Candles,the candle color can be customized.Ingredients: main ingredients paraffin heating melt into liquid and heat slightly volatile, you can smell the unique smell of paraffin wax, frozen solid when cold, absolute environmental harmlessness.Storage method: please store it in a cool, dry place.There are two layers in the Candle Set, each layer has 25 tealight, reveal itself when you open it. Also, the packing can be customized,our usual packing is 50 pcs per pack or 100 pcs per pack.